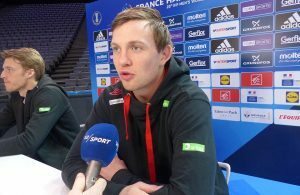 The World Young Handball Player 2014/2015 Sander Sagosen played final weekend at the Men’s EHF EURO 2016 with broken hand, what is now the reason for the “war” between his team Aalborg and Norwegian Handball Federation, writes TV2.no. The Danes responded that they were not informed about the Sagosen hand’s fracture, so they appealed Norwegians to the European Handball Federation. – We have written to the European Handball Federation that we believe it is an obligation that countries or the European Handball Federation (EHF) must contact the clubs after something like that happens, says Aalborg director Jan Larsen to Danish TV2. – Anyone can make a mistake. But we have not heard anything from them. They believe that they have not made any mistakes, and that’s what irritates me most. It is very resentful and does not bode well for future cooperation with the Norwegian Handball Federation, says Larsen. Secretary General of the NHF Erik Langerud denies that they have not been in contact with Aalborg. – It is not true that they have not heard anything from us. Aalborg has received a letter from us about this, he said to TV 2. Langerud understand some of the Danish frustration. – We understand that they are irritated and that it boils a little now. But we also hope they see the issue from our standpoint. This was a difficult situation, in which the player himself did not want this to be communicated out. We could not override this, or ask your doctor to break his confidentiality, he said. – However, we have apologized to Aalborg that they did not get a chance to get a replacement within the transfer window. We fully understand that they are dissatisfied with it, says Langerud. Both sides agreed that EHF rules in this situation must be much more clearer than it’s now. – Alex is 20 years old. He is a fantastic handball player and would love for Norway. We will never stop him. I am annoyed with the Norwegians, but we can not keep Sander home because of it, says Aalborg’s Larsen. Langerud think in turn that relations between NHF and Aalborg will be fine. – We work well with most clubs around the world, and I think we’re going to do it with Aalborg in the future. ← Previous Story 300 DAYS WITHOUT HANDBALL: Mariusz Jurkiewicz is back!